Preheat oven to 200°C. Brush the beef roast lightly with oil. Season the beef with the salt flakes and pepper and rub some of the thyme leaves over the beef. Place the beef on a rack in a roasting dish. Place the thyme sprigs and sage leaves over the beef, pack the pieces of garlic bulb around it and drizzle the garlic with a little olive oil. 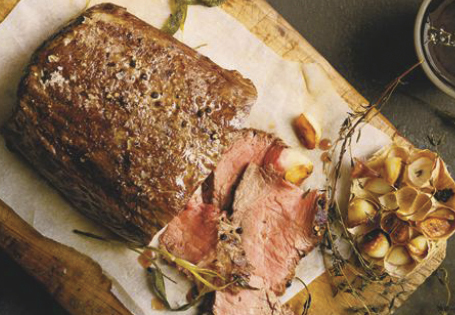 Roast the beef for 60 minutes for rare, 75 minutes for medium or 90 minutes for well done (approximate – depends on weight of fillet). Remove the beef, cover it loosely with foil and rest it for 15 minutes before carving. Gently prod or squeeze the roast to check how cooked it is. Rare is very soft, medium rare is soft, medium is springy but soft, medium well is firm and well done is very firm.